Free to play or pay to win? "Try it! It's free!" Allen Murray, PopCap senior producer shouted at PocketGamer about free-to-play mobile game Plants vs Zombies 2: It's About Time. "Our hope is that you'll have so many hours of fun, you will want to spend a few dollars." Murray's definition of 'fun' might differ from a lot of other people's, and though Plants vs Zombies 2 received near-total positive reviews, many dissenting critics still called out its free-to-play approaches as detrimental to enjoyment. What with Angry Birds Go! 's outrageous £34.99 ($49.99) pricetag for a single Big Bang Special Edition kart, the seedier side of IAP has never been under more scrutiny. But do publishers and developers even care? 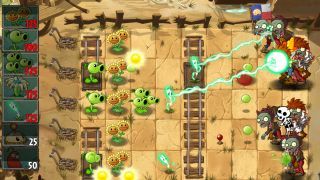 Plants vs Zombies 2's star system was singled out as its major barrier to seamless, penniless fun. In order to progress beyond a given area, an arbitrary number of stars had to be collected, awarded based on how efficient you are at fulfilling a number of criteria in each level. The stars only became active after playing through said area, so only after playing through the core levels did the stars become available. Sure, you could go back and retrace your steps like a chump, or pay right there to carry on. Is anyone really willing to shell out that much? In response to these criticism, PopCap has just released a hefty Christmas Update. Along with a new map, features and foes, the star system and map have both been removed and re-jigged, streamlined for quicker and easier progression. So we carried out a mini investigation, pitting a paid-up player of the vanilla version - at our expense of £18 (about $30, AU$32) - against a free-playing Christmas update user, to see if Popcap has found a better balance - or if the person who doesn't pay is guaranteed to find themselves at a disadvantage. We enlisted the help of Katherine and Robert Egan, brother and sister, because nothing spells parity and fairness like participants sharing roughly fifty percent of their DNA. Both played on an iPhone 5, Katherine paying up front whilst Robert was barred from even thinking about doing so. Rob was immediately taken in by PvZ2, the entire concept a welcome dose of whimsy. "I love the whole going back in time for a taco thing. It's just illogical, which is the best way to go for apps," he said. Both were instant fans of the gradual build-up each level. Katherine praised the open approach and the way it facilitates "personalised defences", while Rob found each level "a lot" shorter than the first game, but the pacing still seemed "right", as if condensed. On the fourth in-game day, Katherine just about managed to stave off the waves and found this level "noticeably harder". Rob found it too become "trickier quite quickly" but relished the challenge. Then, inevitably, came the store. "Nothing too appealing about it as far as I'm concerned," stated Rob. "It seems pointless when the game itself offers a variety of ways to get money anyway, as long as you're skilled enough." A fair point, but a free-to-play game that offers everything for free might please Karl Marx, but won't feed a developer. When it came to Plant Feed, a temporary speed buff unlocked through either purchasing or killing carriers, Katherine found it "helped" as a welcome modifier, changing up the flow of gameplay, rather than just a cash-grabbing gimmick. Similarly, Rob loved it and called it his "favourite addition" and said "it's the difference between losing a plant." Even though more can be purchased with coins, Rob said he felt "the game supplies you with as many as you'd need" and didn't make him feel at a disadvantage, though he wasn't repelled by the idea of purchasing more from his own wallet. This was an important point.